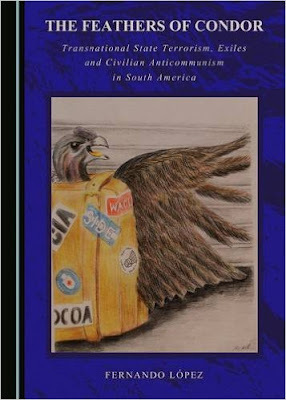 An independent site and association of researchers examining the politics, cultures and histories of Latin America. On 12 October 2015, Radio SBS Spanish from, Sydney, Australia, interviewed Dr Fernando López and announced the upcoming official launch of The Feathers of Condor: State Terrorism, Exiles and Civilian Anticommunism in South America. On 16 October 2016, Latitudes, the School of Humanities and Languages at the University of New South Wales (UNSW) and Cambridge Scholars Publishing (CSP) held the official launch in Australia of the book The Feathers of Condor, authored by Fernando López. The event began with a brief introduction by Fernando López and a special online message by Dr Patrice McSherry from the University of Alberto Hurtado Chile. Dr Rodrigo Acuña from Macquarie University and Dr Peter Ross from UNSW shared their views regarding the book's significance and its contribution with the public. Dr Pablo Leighton continued with a general analysis of the historical context and presented a detailed overview of chapters One and Two. Dr Fernando López concluded the event with a general outlook of the content of Chapters Three and Four, followed with a short Q&A session with the public. The Feathers of Condor can be bought as hardcover directly from Cambridge Scholars Publishing, Amazon UK, and Amazon US.